A big shout out to Center Cut Cook for this scrumptious dessert. 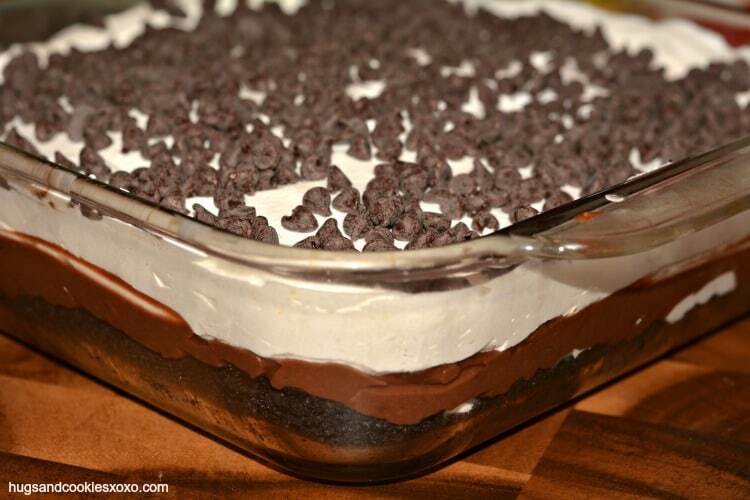 Apparently, they used to serve a chocolate lasagna like this at the Olive Garden that was out of this world. Now you can make it at home! I have to warn you, this dessert is crazy popular. 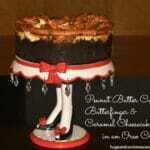 If you make this for a party you WILL be stalked for the recipe. I don’t mean stalked once, I mean over and over. People will beg you for this recipe and you will have to admit how easy it was to make even though it looks like a very involved masterpiece. Definitely a winner for a pot luck or dinner party. Kids love this one, too! I mean there are Oreos in it so pretty much everyone will love it! Get Your 9×13 pan Here! Pulse oreos in the food processor until crumbs. Stir with the butter and press into a 9 x 13 inch pyrex or baking dish. Meanwhile, in a mixer, beat cream cheese fluffy. Add the 2 T. milk & sugar. Add 1 and ¼ cups Cool Whip. Spread this mixture over the chilled crust. In another bowl, whisk chocolate puddings with the 3 and ¼ cups milk until it thickens. Spread this over the cream cheese layer. Spread the rest of the Cool Whip on the top and sprinkle with the mini chocolate chips. Chill several hours or over night before cutting! 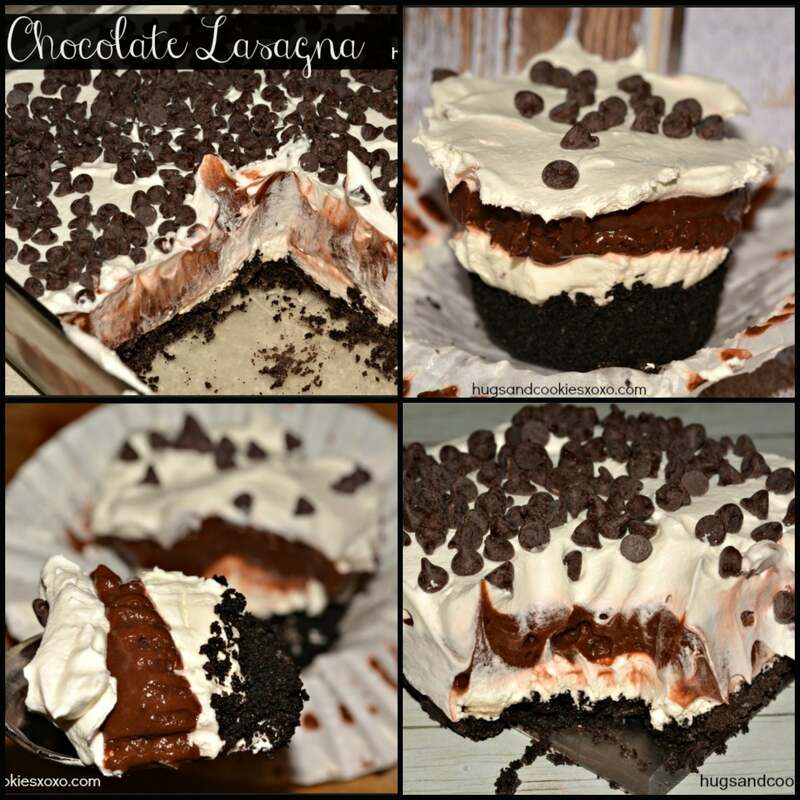 Could you please email me this recipe… Chocolate lasagna and others that are related? I am a chocolate freak. Love chocolate better than anything. 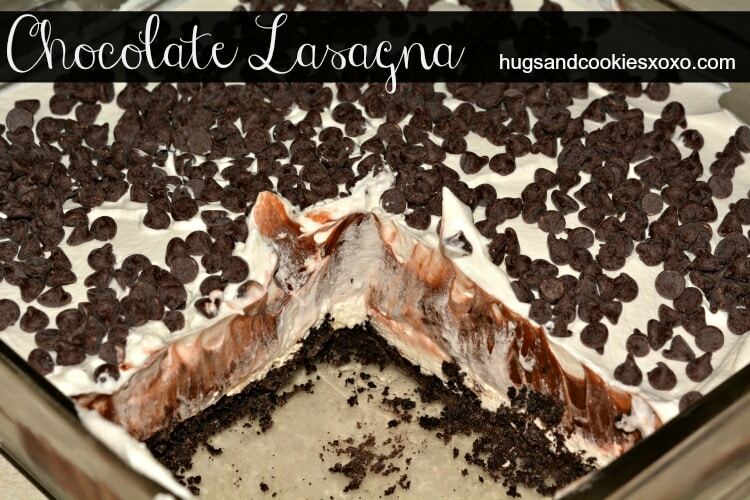 I would love to have your recipe of, “Chocolate Lasagna”, please. Thanks so much!! Butterscotch pudding is really good instead of chocolate it is called Butterscitch slush made say way just different pudding it’ s ion the Jello pudding website. can you use chocolate graham crackers? I will try choc. graham crackers and let you know. oreos is a little pricey here. church dessert coming up. Since Oreos are pricey where you live, try this for the crust: one cup flour, one stick of butter and one cup of chopped pecans. Press in the bottom of the pan and bake 10 to 15 minutes until slightly brown, then cool. I’ve been making this dessert for years with the pecan crust and it’s always a hit. I do everything else the same way except for the crust. Sometimes instead of chocolate chips on the top, I grate a chocolate bar on top. You can make this with any flavor of pudding and it’s good. At Thanksgiving, I use pumpkin spice pudding. Wonderful! 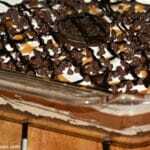 This is not the chocolate lasagna from Olive Garden, theirs is 7 thin layers of chocolate fudge cake with each layer frosted with white buttercream frosting, then the top is covered in white buttercream and topped with chopped semi-sweet chocolate bar, I use Ghiradelli. Another tip, you also use meringue powder and butter to make the buttercream frosting, you can buy it from a Wilton store, or cheaper at Walmart. I got the recipe from Olive Garden’s Italy Kitchen, where they develop all the recipes. If you email Olive Garden Test kitchens they will give you any recipe you want. Alot of work to make but delicious. OMGGGGGGGGG This looks absolutely incredible! Creamy and decadent. 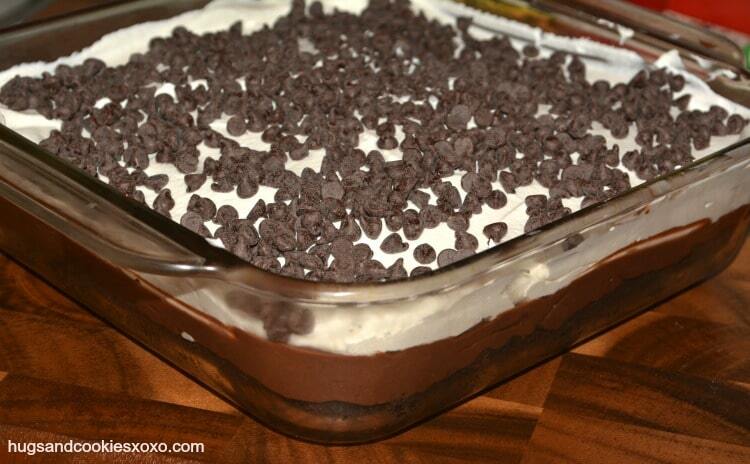 Have you thought about substituting chocolate mousse in for the chocolate pudding? I made it last night and it was a little sweeter than I wanted. 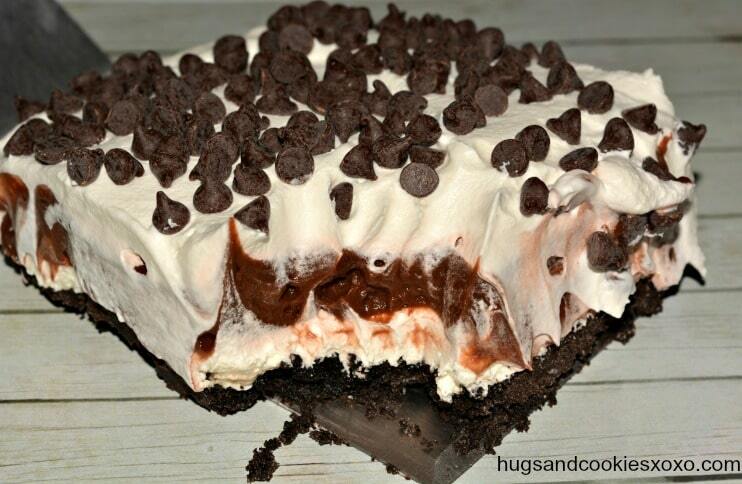 It also reminded of the Hershey chocolate pie. Thanks for the recipe! Whipped cream that’s not dairy based. 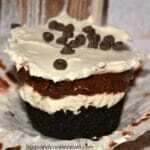 I would love to make it with a brownie bottom. Man would that be yummo! I’ve made a similar dessert before and recommend not putting the top Cool Whip layer on too early or the chocolate will start to bleed through. Also, love the chocolate chip idea. That’s not part of my recipe but it will be in the future!! Try to copy, paste, post to your email, send to yourself. Is there a way to make this without using cream cheese? 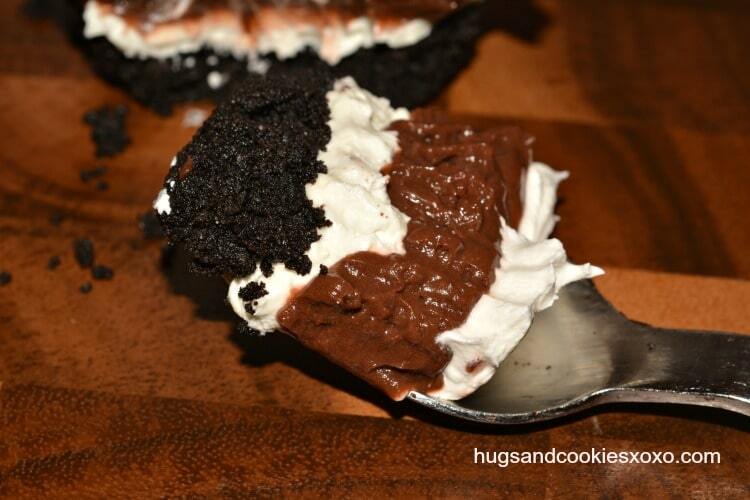 My family doesn’t like desserts with cream cheese in them (they do not like the taste) , but this looks so good! I hate cool whip. Can you use real whipped cream? I was thinking of trying chocolate mousse too & maybe marscapone instead of the cream cheese. Any thoughts?? 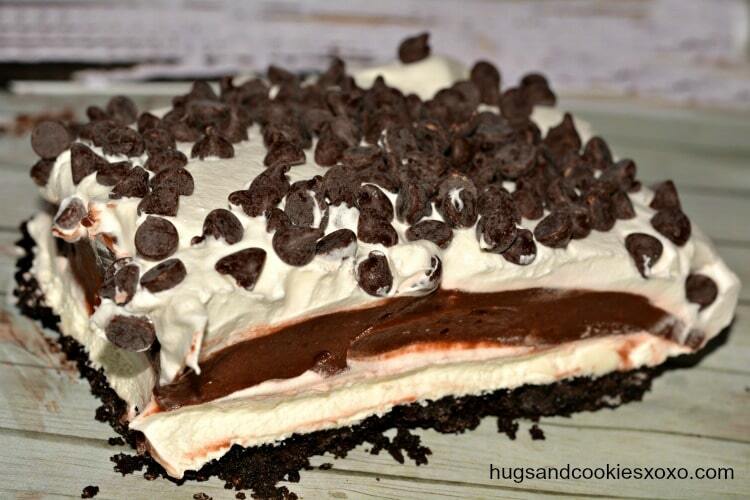 We call this Mississippi Mud in the south! We make it with a graham cracker crust and put chopped pecans in the crust and on top. Sounds like a wonderful receipe,thank-you. Would appreciate receiving recipes. Thank you very much. OK, will enter your email! And the other chocolate church desserts. Diane-you can sign up for emailed recipes on my page. Saw on Facebook, can’t wait to try. 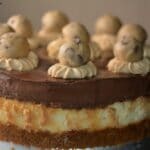 Would like to receive other recipes. Thanks. You can sign up for emails right on my page!!! Thanks for being here! Will this keep well in the freezer? 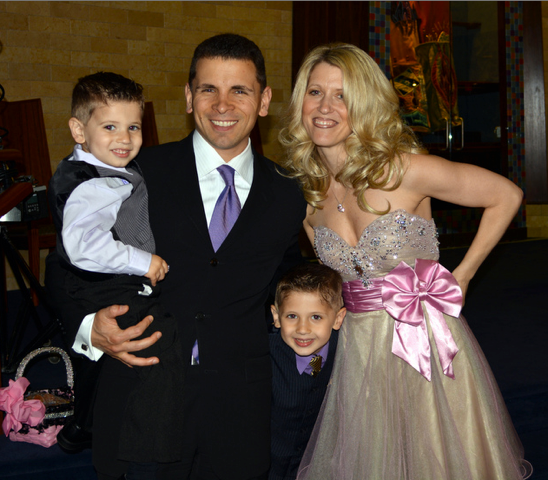 We have a small family and won’t use it all in one setting. Thanks! I haven’t frozen it myself but imagine it would be fine! Please add me to the email list. Also can you make this without cream cheese? When you Pulse oreos in the food processor until crumbs, do you need to take out the filling from the oreos before doing this? It says to use a 9 by 13 inch pan but the one in the picture looks smaller. Can you use either size? If you use an 8×8 you must halve this recipe. Can’t eat cream cheese, what else could I substitute that for? When I crush the oreos do I include the cream center or do I remove it. Pistachio pudding is my favorite. But I use a flour, butter and pistachios crust. I made this today and we loved it! This is def. On the menu for my next Facy Dessert Friday! Yum! don’t like cool whip and instant pudding texture could i sub real whipped cream and the cooked pudding with the 3 1/4 cups of milk? My very similar recipe calls for cool whip OR whipped cream, and either one works out nicely. I haven’t tried it with cooked pudding, but as long as it’s cooled when served, I don’t see why it would be a problem. This adds a little to the recipe I have already been doing. I like the oreo and chocolate chips ideas. We use 1 cup flour, and 1/2 cup butter for the crust (baked about 12 minutes at 350). It is also really good with pistachio pudding, but for a potluck, more people will eat the chocolate pudding kind. I have made this multiple ties and it is delicious. My favorite!